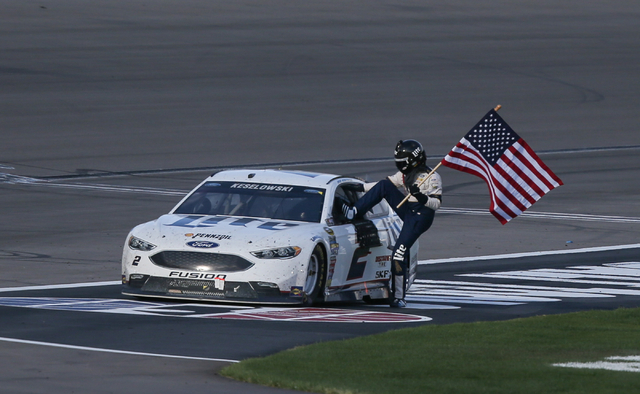 Quotes from drivers and others after Sunday’s NASCAR Sprint Cup Series Kobalt 400 at Las Vegas Motor Speedway. Kobalt 400 winner Brad Keselowski, on holding off the field by more than a second after taking the lead with six laps remaining. Driver Denny Hamlin, who dropped back to 19th after starting ninth. Driver Ricky Stenhouse Jr., who finished 12th, on the blustery conditions. Driver Dale Earnhardt Jr., who was worried about the sandstorm that nearly overtook the track during the second half of the race. Ryan Blaney, a rookie who finished sixth after qualifying 14th. Second-place finisher Joey Logano, on the effects of the wind and rain on the race. Driver Matt Kenseth, whose car appeared to lose control on Lap 225 and slid into rookie Chase Elliott’s Chevrolet. Paul Wolfe, winner Brad Keselowski’s crew chief, on his team’s fuel strategy near the end of the race. Walt Czarnecki, chairman of Team Penske, on his driver Brad Keselowski’s victory, which clinched a spot in the season-ending NASCAR playoffs. UFC fighter Miesha Tate, who is represented by driver Kevin Harvick’s management company. On Saturday night, Tate upset Holly Holm for the UFC women’s bantamweight title.